In 2016 some new buzz words have been thrown around the online tech industry, but what is a chatbot and why is it important? First, let’s take a step back. A bot is a computer program which responds to input by making things happen. Specifically, a bot listens to the user and responds with information. 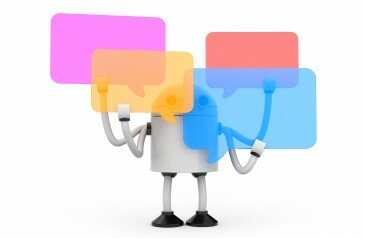 Today bots are so prevalent in the online environment; it is highly likely you have already used one without knowing. A chatbot then is a bot who lives within a chat platform or anywhere you have a lot of conversations. Typically, this is a messaging service platform like Facebook Messenger or Kik. Just this year Facebook, Telegram and Kik all made platforms for bots on top of their messengers. With over 900 million monthly users on Facebook Messenger and 200 million on Kik, a chatbot has the potential to reach over a million users just by using those two platforms. One of the more challenging tasks is defining what a chatbot can do and what advantage they have over previous technologies. Throughout the recent technological hype, the focus of most of the excitement has surrounded two concepts. The first is that chatbots are a new distribution channel. As apps reach their maturity stage, smart innovators are looking for new methods to engage users. Bots are now heralded as the next wave of direct marketing for brands, fitting into customers’ changing lifestyles. The second concept is the idea that chatbots allow brands to remove expensive humans from customer communication. The chatbot attempts to respond and act more like a companion or personalised shopper, always ready to help. They are reported to substitute for a human in a range of areas, from games to purchases and simple conversations. Why businesses should use Chatbots. Let’s imagine a client called Sally. Sally has recently ordered a package and wondering how long it will take to arrive. However, when she rings your company, she discovers it is after work hours, and the office is no longer open. Rather than being frustrated she enters Facebook messenger and queries your company chatbot. The chatbot cheerfully tells her the package will arrive the next day and that shipping usually takes three days. Thrilled with the response, Sally tells all her friends and continues to use your company in the future. In this situation, a chatbot was vital for the business maintaining a happy customer who will go on to become a loyal shopper – all at 10pm at night! Chatbots are increasingly becoming a part of our online future, turning transactions into conversations. If your business is considering chatbot technology, talk to us at One Stop Media.